Re: mice!!!! what to do? That is the work of voles. The trees appear to be completely girdled, but it's hard to tell from the pictures whether the cambium is still there or not. If they survive, there most assuredly will be a lot of scarring which could be good or bad. You really don't have a lot of options. I suppose packing the entire area with sphagnum moss may help the bark repair itself, as well as keep the voles from coming back to chew on what ever is left. 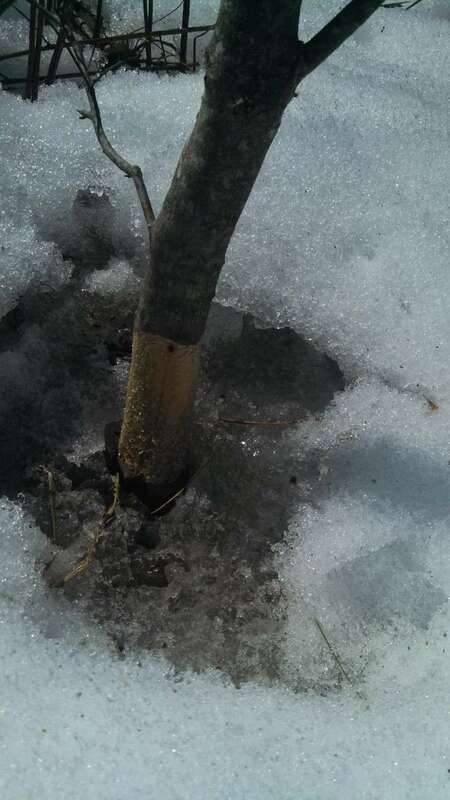 I've had vole damage like this when I lived in MA during snowy winters but it was to smaller landscape trees that I didn't bother trying to save. I wish you good luck and let us know the outcome. 1 packet of traps and 1 jar of peanut butter should do the trick! Those look out in the open? but, In my greenhouse, cutting box andhoop house I solved the problem completely by tossing a few moth balls around in the fall. 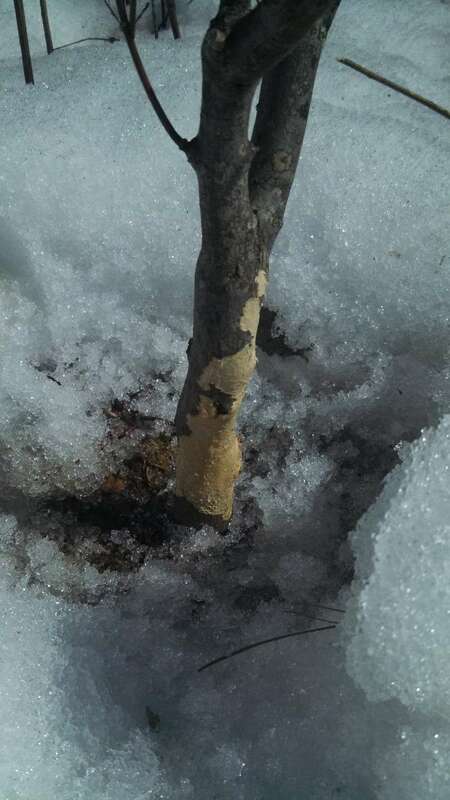 We put mothballs all through our trees when we're packing them in for the winter. We put them on the surface of the soil, also around the perimeter of the bed. We haven't had a problem with voles since then. They don't like the smell, apparently. I just had a vole attack this winter. Just about killed all of my trees. Show trees. They worked their way down from the best. Moth balls don't work. Traps don't work. Mouse poison won't work. Building a structure out of 1/8" hardware cloth this year. All sides. Even the bottom. If you want to kill the things a remedy that sounds like it works real well is concrete mixed in the peanut butter. I can't post the pictures here but they are on the Bonsai Nut site. They ate the best jack pine bonsai on the planet! M. Frary wrote: I just had a vole attack this winter. Just about killed all of my trees. Show trees. They worked their way down from the best. this year its gonna be like bowie said: "THIS AINT ROCK N ROLL... THIS IS VOLICIDE !!! I've talked about this on bnut but I'll share my experiences here. I've had problems with rabbits and voles when wintering trees outside. I was able to fence rabbits out of my nursery bed, but it's pretty difficult to fence out voles. 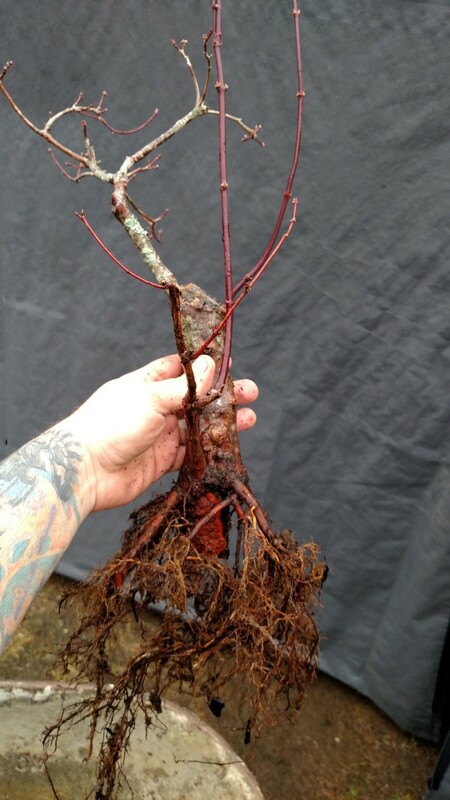 So for my in ground pre-bonsai, I'll wrap the trunks with that plastic tree guard in the fall. It's time consuming and tough on the back, but so far trees that have been wrapped have not had any damage. I don't wrap everything, just the things I care most about and younger stuff that has small trunks that could be easily killed. My bonsai are now all wintered inside my barn and garage. In the barn, the first couple of years I put them on the floor with mulch, but I had vole and mouse damage. To combat this, I built a roughly 10x10 shelter within the barn, it is wrapped on 3 sides with foam insulation board and the rest is covered with plastic sheeting. A thermostatically controlled heater keeps temps at 27/28 F or above. Now I store almost everything on tables in this enclosure and that has eliminated mouse attacks. The few things that still must go on the floor get the trunk wrap and the soil is covered with foil or wire (mice like to burrow into the pots to eat roots and store food). As for deterrents...I've tried those ultrasonic rodent repellent devices but they don't seem to work...have seen mice run right over them. Have tried mothballs. They stunk up my barn but had no effect. Maybe I didn't use enough. I didn't put them right on the soil like some have suggested, but rather around the enclosure. I do set standard mouse traps baited with peanut butter which catch a few mice and voles. I've had no problems with mice or voles eating trees so I'm pleased about that and commiserate with those who have. I've had two beautifully ironic incidents with mice in my garage and my shed though - first time the mice ate their way into my rat poison container; second time they ate their way into the slug pellet container. Goodbye mice! So maybe slug pellets would also be worth a try. I told folks on another forum about cement and peanut butter. Seems like they think Im crazy. But my aunt in Northern Ga had a HUGE infestation of mice in their basement. They had dogs sleeping in the basement, so poison just wasnt an option. She read on google about mixing dry cement and peanut butter. They eat it right up, then get thirsty and the water kicks off the cement, making a concrete rock in their belly that is fatal every time. She had so many dead mice that the house was almost unlivable for a while! So Id recomend trying it because its non toxic, so animals who may eat them dont die too. And since its earthday, and organic solutions should be our future. Eric F wrote: I told folks on another forum about cement and peanut butter. Seems like they think Im crazy. But my aunt in Northern Ga had a HUGE infestation of mice in their basement. They had dogs sleeping in the basement, so poison just wasnt an option. She read on google about mixing dry cement and peanut butter. They eat it right up, then get thirsty and the water kicks off the cement, making a concrete rock in their belly that is fatal every time. She had so many dead mice that the house was almost unlivable for a while! So Id recomend trying it because its non toxic, so animals who may eat them dont die too. And since its earthday, and organic solutions should be our future. You are probably crazy,but that's beside the point. I'm going to try this out this year. Along with a cube made out of 1/8" hardware cloth to put the trees in. No more of that crap. On a different topic I've been out collecting to build back up. Got some nice tamaracks,jack pines and a couple scots pine so far. Today it's hawthorn. but i guess that means the devastation was as bad as you thought, eh ? Yup, Im fairly crazy for sure! Crazy enough to move here (Costa Rica), alone then try to learn bonsai on the internet. In a place that has close to nothing for bonsai,much less a club. After 10 months I dont have a bonsai friend here..but I dont give up easily and I learn fast when obsessed with something. Like you said thats beside the point. I wish my aunt were still with us to ask for details (and so much more, she was great). But I think google can tell you the ratios to make it work setting up the cement. I guess the peanut oil keeps it from hardening til water is introduced. Anyway, its a great trick that is eco griendly unlike poison. And Ive never heard of vermin that wont eat.peanut butter. That and the cage are probably going to get rid of your problem. Let us know, Id like to know what ratios work and how it turns out for you. Good luck! Can't post here but yeah the devestation was bad. The started at the biggest and best and worked their way down the line. I lost at least one of every species. I have no more shimpaku. Best jack pine toast. Biggest American elm finished. Best scots pine. Amur maple. Hawthorn. The list is quite extensive.